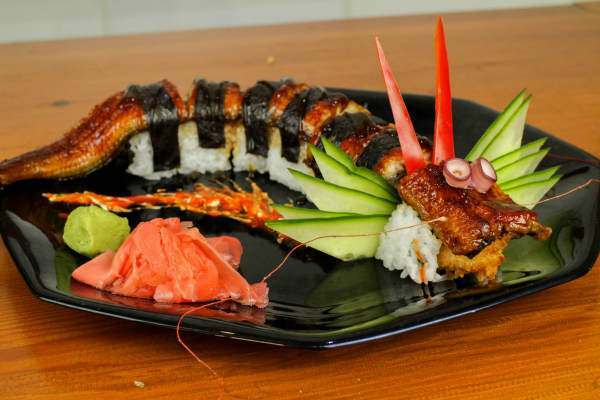 Breathe fire into your sushi creations with this artistic Dragon Sushi Roll recipe. Its body is filled with a tasteful combination of crunchy tempura shrimp and avocado. Flavors are enhanced with a layer of juicy unagi filet and fragrant unagi sauce. The dragon is brought to life with just a few strategically positioned food elements, completed with a blaze of mayonnaise and Sriracha sauce at each side. Start by putting your bamboo rolling mat in a plastic zip-lock bag. This will enable you to compact the sushi roll later on, without the rice getting stuck in the rivets of the mat. Put a whole sheet of nori onto the mat. Moisten your hands with a bit of cold water. This prevents rice sticking to your hands. Now spread 120 grams of cooked white sushi rice over half the surface area of the nori sheet. Leave a space of 2.5 cm wide at the end closest to you. Flip the nori sheet over so that the rice-side is face down. Arrange three battered tempura prawns across the width of the nori sheet. Add a row of three avocado slices next to the prawns. Lightly drizzle the filling with Unagi sauce. Bring up the side of the bamboo mat closest to you. Curl it over the fillin. Use your fingers to gently compress the roll as you go. Continue rolling until you reach the end of the nori sheet. The moisture of the rice will help the sheet ends to adhere. In case you’re using frozen eel filet, first defrost it. Then briefly grill the eel for five minutes. This brings out the natural flavor and oils. Cut the filet in half lengthways with a sharp knife. You will only need one half of the filet for this recipe. 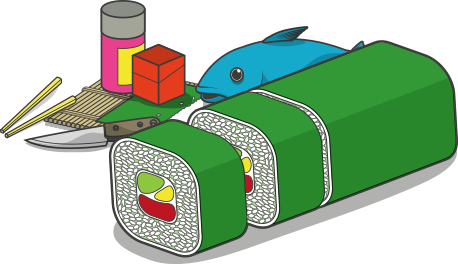 Place the sushi roll on the cutting board. Put the half eel filet on top of the sushi roll. Let the pointed ‘tail’ overhang at one end. This will make it look like the dragon’s tail. Put cling film over the unagi topped sushi roll. Use your fingers to gently shape it around the roll. Cover the entire roll with the sushi mat. Then use your fingers to compress the top and sides so that the eel is firmly pressed into the rice. Leave the cling film in place. This will help you make cleaner cuts later. Moisten the blade of your knife with a bit of cold water. Position your knife approximately 3.5 cm from the flat end of the sushi roll (not the pointed tail end) and cut. Repeat until you have 6-7 segments, plus a larger one at the tail end. Put the bamboo mat over the sushi roll. Use your fingers to gently compress and firm up the segments. Remove the cling film. Before transferring the roll over to a plate, attach a small, 1 cm wide strip of nori to each segment, starting from the second piece at the head end. This will help the unagi and rice stay in place. Use your fingers or the flat of your knife to transfer the roll segments onto a plate. If the plate isn’t big enough to arrange the dragon in a straight line, position the segments in a curve. Let the tail segment sit at an angle in line with the edge of the plate. For the dragon’s eyes, simply push two octopus suction cups into the unagi at the head end of the dragon. Now create the dragon’s manes. Cut a whole cucumber in half, then half it again lengthways. Cut off the end. Make wafer thin cuts along the length of the cucumber. Continue until the entire half comprises small wafer thin slices. Discard the two pieces from each side. Position your knife at the widest point of the cucumber at a 45 degree angle. The cut downwards diagonally. Discard the end pieces. Peel away half of the cucumber in slices and fan them out using your fingers. Repeat with the remaining slices. Place a cucumber ‘fan’ on both sides of the dragon’s ‘head’, between the first and second segments. Slot two paprika slices in the same space so that they stand up behind the head. For the whiskers, deep frie an unpeeled shrimp. Remove the whiskers and and push them into the unagi on both sides of the dragon’s face. Drizzle the entire dragon with Unagi sauce. To create the illusion of the dragon breathing fire, create a zig-zag with garlic mayonnaise on each side of the dragon. Do the same with Sriracha sauce. Using the tip of a cocktail stick to pull the Sriracha sauce through the mayonnaise with swift, fine strokes until the two combine. This creates a flame-like effect. Arrange a handful of pickled ginger on one side of the plate alongside a generous squirt of wasabi paste. Now the dragon is ready to be served. October 7, 2017 Sushi Art, Vegetarian "Bejiterian"
February 11, 2015 Salmon "Sake", Sushi Art, Tuna "Maguro"